This exhibition pairs Galbraith’s 2003 mixed media work on paper Two Straight Lines For La Monte Young, originally shown in Berlin and on view at Diapason for the first time in New York, with a new work for multichannel sound entitled Composition 2005 No. 1. The work on paper references American composer La Monte Young’s Composition 1960 No. 10 which reads ‘draw a straight line and follow it.’ Galbraith’s Two Straight Lines For La Monte Young uses twenty pages of tabular random permutations of integer numbers overlaid with systematically placed small blue dots. 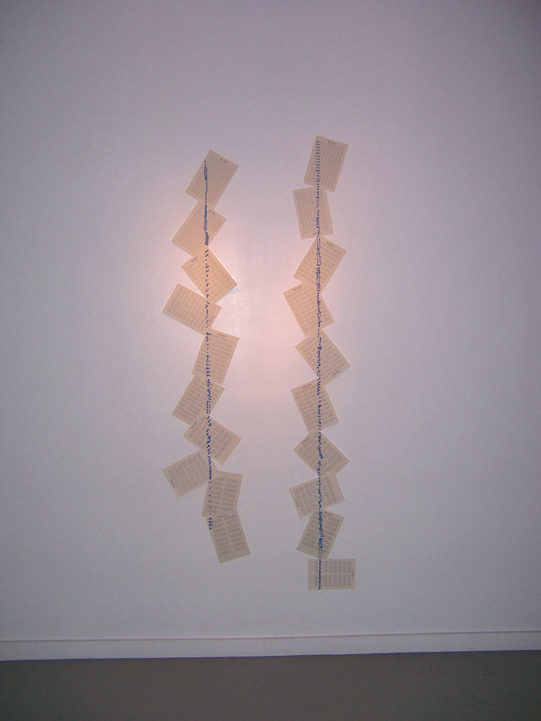 These pages are pinned to the wall each skewed so the blue dots produce a pair of vertical straight lines each over six feet long. With this work Galbraith breaks from the singular act called for by Young’s score and instead creates through repetition and serial techniques two straight lines that emerge from an infinite numeric field. For Composition 2005 No. 1 Galbraith transformed Two Straight Lines For La Monte Young into a graphic score for string quartet. Galbraith realized this score by recording the process of hand tuning each note using his self-built analog electronic sound oscillators. The work is animated by the micro-intervallic tension between two sets of pitches: the ‘absolute’ sine tones determined by graphical analysis and the ‘string’ tones which are derived from the ‘absolute’ tones by quantizing each to the nearest note of a justly intoned scale. The final work is a multichannel edit of the ‘absolute’ manually tuned quadrature oscillator sine tones, digitally synthesized reference tones, and the recordings of the ‘string’ tone manual tuning process. Two Straight Lines For La Monte Young, mixed media work on paper, 2003.